The holiday season is just around the corner, but you don’t have to wait to start enjoying the fun. Much of the excitement of the holidays comes from the anticipation and preparation for the celebration. A great way to do that is by planning your Christmas lighting and décor. This year, instead of your usual lighting design, why not work on a more unique and creative way to decorate your home or business? The best way to begin the process is by thinking of a theme or a color scheme. It could be the pretty blue and white colors of a winter wonderland. Or the green and red of a traditional Christmas. Maybe you prefer the classic look of all white lighting. Or how about a gingerbread house theme? Try theming your home to elements of your personality. If you’re a sports fan, you could use the colors of your favorite sports team. Welcome the Rams back with blue and gold colors, or cheer Lakers on with purple and gold. Beach lovers might enjoy a tropical holiday theme with Tiki elements and maybe even a surfing Santa. There are dozens of themes and combinations to try. After the overall theme is decided, think of ways to apply it to lighting and decorating your property. Start by cheering up the entryway. Wreaths and garlands are always good for welcoming people. You can also adorn your porch or front yard with props like toy soldiers, reindeer, a sleigh loaded with gifts, oversized gingerbread men and lollipops and more. And don’t forget to wrap or add a fun topper for the mailbox. Trees and greenery are important elements of your theme. Think of creative ways to illuminate them and add height to your design. The entire tree can be wrapped with lights, and you don’t have to settle for just one color. 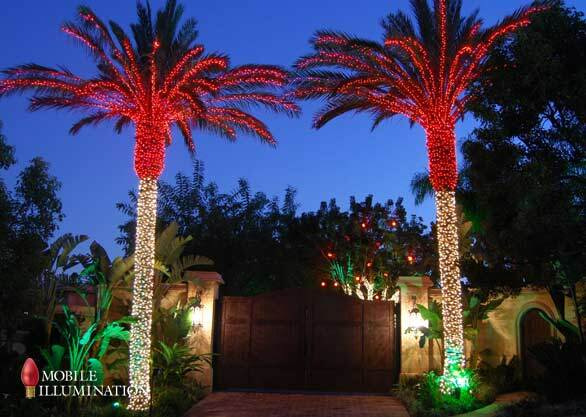 Palm tree trunks can be wrapped in yellow lights with the fronds in green. Other types of trees can be wrapped in white and red lights for candy cane effect. The lights can also blink and “chase” up and down the tree. Another way to decorate large trees is by hanging oversized ornaments and lit spheres on the branches. There are even fun color-changing LED spheres that can be programmed and controlled with a remote. Highlight your home or building’s structure with twinkling lights along the roofline and around windows. Or bathe the walls in color with LED ground lighting. 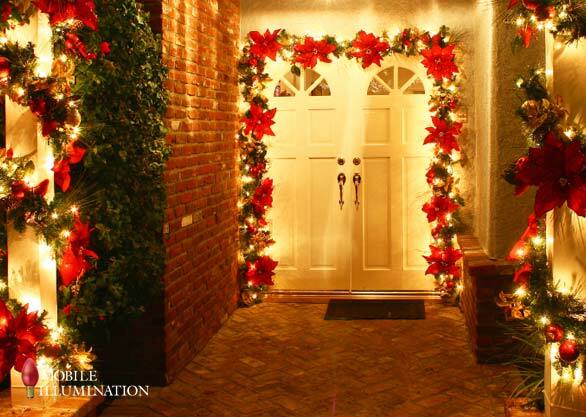 Use lights along walkways to frame them and guide visitors into your home. It’s the little touches that make your theme original and distinctive all from others. 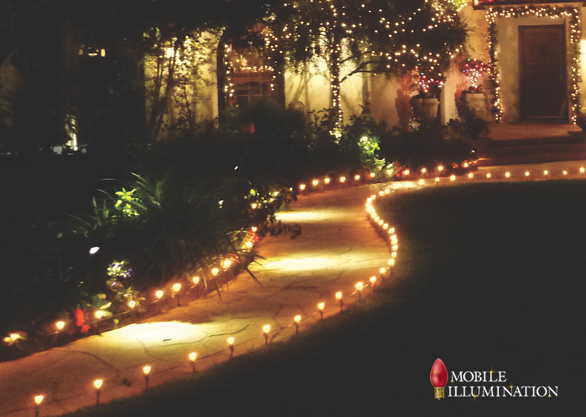 At Mobile Illumination, we’ve been helping people come with creative holiday lighting and décor designs for their homes and businesses for over twenty years. We can help you make your property the most memorable one on the block. Give us a call today, and start planning your professional installation soon.